To Soviet citizens rushing to escape the 1941 German invasion, the far-off, exotic Uzbek city of Tashkent represented survival and safety—and a journey filled with danger and hardship. Wat described the scene as an expression of “Russian nomadism.” Those en route, however, were not traditional Russian migrants. Nor, properly speaking, were they refugees. Unlike the archetypal European refugee, they were displaced but not stateless. In official Soviet parlance, moreover, they were “evacuees,” not refugees. The term highlights the specificity of their experience. They were compelled to depart not only by a devastating war but by a government, their own government, which sought to protect the lives of its citizenry, to keep valuable “human resources” from falling into enemy hands, and to assure the security of the state by clearing frontline regions. 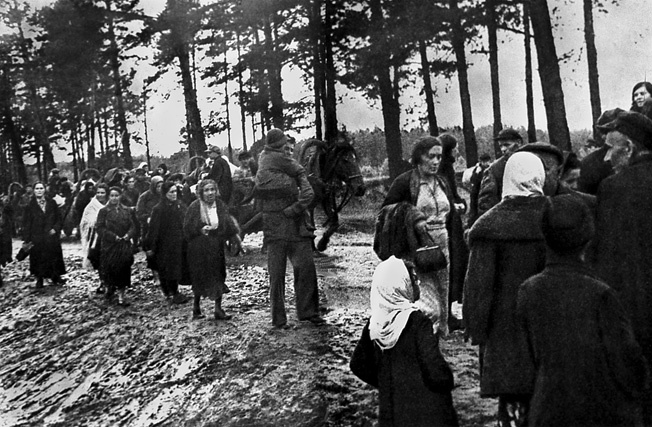 Between the German invasion in June 1941 and the autumn of the next year, approximately 16.5 million Soviet citizens were evacuated to the country’s interior. The scale of the operation was unprecedented. 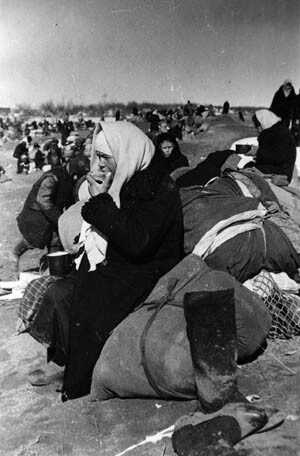 Evacuations were carried out in eight different Soviet republics and from territory that was home to approximately 40 percent of the Soviet population on the eve of the war. As Wat’s description of the train station suggests, moreover, the evacuation touched Soviet citizens from all walks of life. 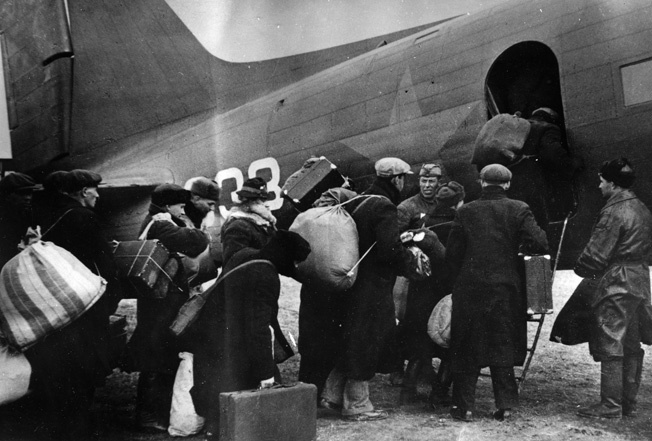 Evacuation was conceived by the Soviet state, in keeping with prewar developments, both as a form of economic mobilization and as an attempt to manage migration from the front lines. Although not punitive in nature, the operation was heavily indebted to the practices of population transfer developed over the previous decade. Furthermore, the operation was structured around a hierarchy of people and places that reflected both an existing system of privilege and an ideologically informed vision of the Soviet polity. Finally, evacuation was conceived to protect not merely certain sec- tors of the population but the entire socialist state. At its core, the operation aimed to retain control over Soviet space, threatened, in the eyes of the state, not only by German forces, but by “enemy elements” and internal dissolution. On June 24, 1941, two days after the German invasion had begun, an Evacuation Council was hastily created by joint decree of the Central Committee and the Council of People’s Commissars. Evacuation was in many ways thrust on the Kremlin. German forces had already wreaked havoc along almost the entire length of the Soviet Union’s western border; taking advantage of the state of surprise, they had destroyed communication lines, dispersed defending forces, and broken through the system of frontier defenses. By the time the decision to establish the Evacuation Council was made, officially sanctioned evacuations had already begun in both Latvia and Belorussia. Panteleimon Ponomarenko, then first secretary of the Communist Party of Belorussia, recalls having called Stalin on June 23 to request permission to commence evacuations in the Belorussian Republic. Stalin was allegedly surprised by the request and wondered whether it was really necessary. 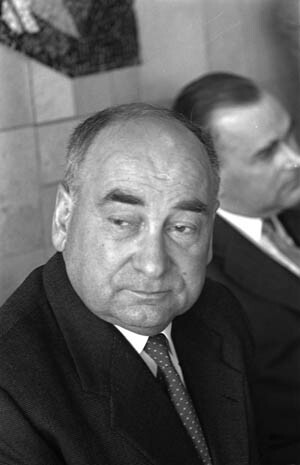 Postwar photo of Panteleimon Ponomarenko, then first secretary of the Communist Party of Belorussia, who first urged Stalin to evacuate areas threatened by war. Still captive to the principle of an offensive war and slow to grasp the scale of the disaster unfolding on the front lines, Stalin had, only the day before, ordered the General Staff to launch a counteroffensive and to invade enemy territory. Ponomarenko’s report, however, left little doubt as to the gravity of the situation: such was the rapidity of the German advance that a large-scale evacuation from some of the western regions of the republic was, in his estimation, no longer possible, and any delay in the evacuation of Minsk and the eastern regions would be “irreparable.” The next day, following countless hours of impromptu meetings in Stalin’s office, the Evacuation Council was established. In the westernmost parts of the country, which were evacuated only when the cities were already under heavy bombardment, losses were particularly heavy. Alexander Kovarskii, a child at the time, later recalled how the train on which he traveled east with his mother and aunt from Vitebsk to Tashkent was forced to stop several times en route as enemy planes bombed the railways. Fortunately for Raisa, they soon found each other, and continued on their journey together. Thirteen-year-old Tania Aizenberg, who was evacuated from Kiev in late August 1941, was not so lucky. Several months later, in Tashkent, she recounted her experiences to Lydia Chukovskaia, daughter of the famous Soviet author Kornei Chukovskii. The train on which she and her mother were traveling had stopped and she was playing outside while her mother prepared lunch in the railway car. All of a sudden, German planes appeared overhead. “I ran into the fields,” Aizenberg recalled. “The fields were very wide. The wheat was already lying in sheaves. I hid in the sheaves. I looked up from under the wheat: the train was on fire, as was the railway car, where Mama was.” Aizenberg made the rest of the journey to Tashkent on her own. 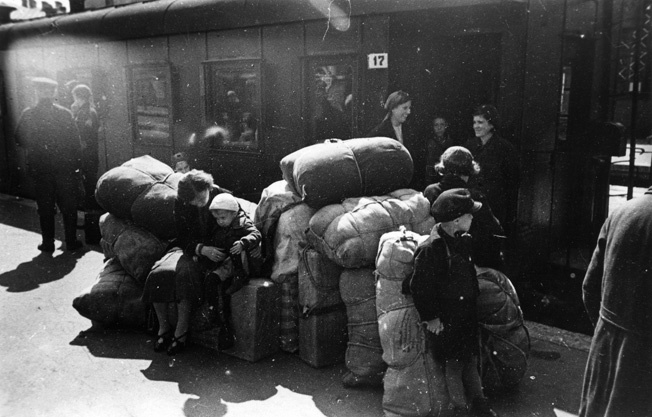 Despite their unknown future, and the fact that the Germans often attacked the trains, mothers (right) smile as they and their children prepare to depart Leningrad by rail, June–July 1941. Memories of the evacuation are invariably associated with bombardment. Sophia Abidor recalled how her boat was bombed en route from Odessa to Sevastopol. Fortunately, the fire was extinguished. In other cases, people traveled by car or truck. In this respect, the military, managerial, and political elite were particularly well provisioned. Despite directives issued in Belorussia forbidding the requisitioning of state cars to this end, the practice was widespread, particularly among military officers who regularly requisitioned cars to evacuate their families. A command issued to the troops of the Western Front in early July noted that “at the same time as active units at the front have a desperate need for motor transport, a significant number of cars settle in the rear and are used in a most disorderly manner.” Party members and factory directors likewise requisitioned cars to evacuate either themselves or their families. Given the scarcity of transportation, many traveled by foot. In the town of Klintsy, where evacuations were left until it was already too late, the civilian population had little choice. The sheer volume of people passing through individual stations on a daily basis overwhelmed authorities and the facilities at their disposal. During the most intense period of evacuations, as many as 17,000 or 18,000 people passed through the Sverdlovsk evacuation center each day. If a new ticket was required, the wait could be even longer. Inna Shikheeva-Gaister and her small circle of traveling companions moved from their apartment in Ufa “to live at the train station, to make it more convenient to stand in line for tickets.” They reached their turn in line after one week. The primary cause of delays was the acute shortage of railway cars. As a report from the city of Kuibyshev put it, “Railway authorities do not provide the required number of railway cars for the dispatch of evacuees.” The transportation of millions of people and goods posed a formidable challenge, which tested the limits of the country’s infrastructure. By November 20, 1941, 914,380 railway cars had been sent east carrying raw materials, industrial goods, machinery, and people. One year later, the number had risen to more than a million and a half. This represented a substantial proportion of the country’s overall transportation capacity. In July 1941, almost half of the existing stock of railway cars was involved in the evacuation. A similar problem was reported on the Black Sea during the evacuation of the Crimea in August 1941, when repeated requests for boats were refused on the grounds that it would simply not be possible “until the freeing up of ships from Odessa.” The shortage of railway cars had a dramatic impact on both the efficiency of the overall process and on the conditions in which people traveled. 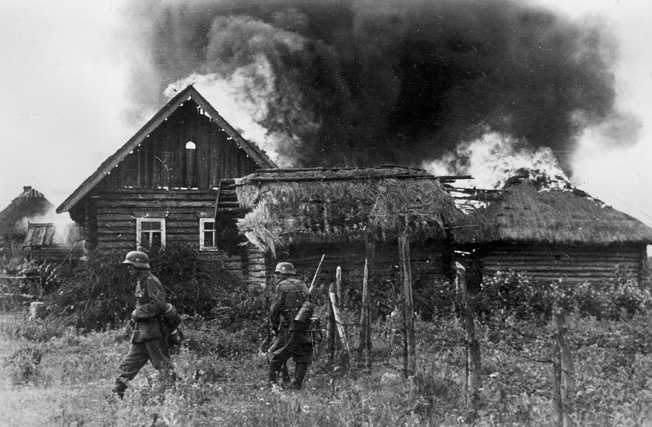 German soldiers set fire to a farm during the ruthless invasion of the Soviet Union, summer 1941. German troops and special police battalions also slaughtered Soviets in their path. The city on the lower Volga that was to become the site of one of the most famous battles of World War II was, in the first year of the war, one of the primary reception points for evacuees. In the first seven months of the war, 438,500 people passed through the city’s evacuation center. According to monthly reports from the center, not a single evacuee spent fewer than two full weeks waiting for connections. Predictably, such conditions sparked bursts of outrage. In mid-November 1941, Nikolai Shvernik, chairman of the All-Union Council of Trade Unions, received an irate letter from a communist stranded in Stalingrad on his way from the Donbass region of the Ukraine to Novosibirsk in southwest Siberia. In Stalingrad, it was reported that only one of the city’s five evacuation centers had hot food. When author Kornei Chukovskii stood in line for bread at a stop by the Aral Sea, he got nothing. What set Chukovskii and his traveling companions apart, rather, was the willingness and ability of higher authorities to intervene on their behalf. Writers, the “engineers of human souls,” traveled with candles and sausage procured for them before their departure from Moscow by Alexander Fadeev, the secretary of the Writers’ Union. Telegrams requesting preferential treatment, moreover, were dispatched on their behalf to stations en route. The relative comfort of the intellectual and cultural elite was ensured not only by the likes of Fadeev, who stood at the head of the literary establishment, but by the highest levels of the political establishment. No less than Aleksei Kosygin, deputy chairman of the of People’s Commissars, saw to it that the evacuated “artists, writers, and honored scientists” were adequately provisioned. In several cases, those who lacked appropriate documentation were simply refused food outright. In this sense, the collective really had become a basic unit of Soviet society. As in Soviet life more generally, travel on one’s own made the journey significantly more difficult. One person was required to stand with the luggage while another stood in line. At the same time, evacuees set about reconstituting the communities that had only recently been rent apart. They sought to reestablish contact with those they had left behind and to bridge the widening gulf that separated them from their loved ones. The memoirs of Zinaida Stepanishcheva offer a glimpse into the mechanics of such a journey. She had been given a ticket for Penza, but on departure from Moscow, she had joined an unofficial, collectively formed echelon bound for Tashkent. When the group reached Penza, the same enterprising individual asked each of the “Tashkenters” for a bit of money, and secured their passage to Chkalov by bribing the coupler to simply attach their car to the outbound train. A representative on the Penza railway line reported that the “evacuated population travels in a disorganized fashion, in all manner of trains, and frequently without tickets.” Stepanishcheva and her traveling companions were clearly no exception. One of the most sought-after sites of refuge in the interior that seemed to possess an almost magical appeal to the evacuees, even though most had never been there, was Tashkent, the capital of Uzbekistan. As Wat’s comments suggest, Tashkent’s appeal was, in no small measure, the product of a fictional account: Alexander Neverov’s Tashkent, City of Bread. Written in the early 1920s, it was adapted into a popular children’s book and was translated into a host of other languages including Polish, Yiddish, and Hebrew. The novel, set during the famine of 1921, followed a young boy on his journey from the famine-stricken Volga region east to Tashkent in search of bread for himself and his family. The book’s title alone helped forge an image of the Uzbek capital in the popular imagination and inspired in the panicked evacuees a desire to reach it. Evacuees line up to depart Leningrad in a PS-84 airplane, the Soviet version of the Douglas DC-3, October 1941. Tashkent’s appeal stemmed from its southern location as well as its almost legendary food supply and distance from the front. Although evacuees would later complain bitterly about the inhospitable climate, many were originally drawn there on its account. Georgii Efron, who was of two minds about leaving Moscow, reasoned in his diary that, “at least one need not fear the cold in Tashkent and its surrounding area.” In Leningrad, where evacuees were sometimes informed about the climatic conditions in different parts of the country by an onsite geographer, Tashkent seemed like an indisputably better choice than Novosibirsk, Cheliabinsk, Sverdlovsk, or one of the many other northern cities that also served as important reception sites for evacuees. The journey to Tashkent was long and arduous. Moreover, as Georgii Efron noted in his diary en route, the “routes that lead there are numerous.” Those traveling from the north tended to take the route through Chkalov, formerly Orenburg. The Orenburg-Tashkent line had been built in the early 20th century, connecting the central Asian colony to the metropole. Before the war, the journey usually took under a week. For those traveling east in 1941, however, the journey was almost always longer. Whereas Kornei Chukovskii traveled the distance in just over a week, Maria Belkina’s train took 11 days, Zinaida Stepanishcheva’s 15 days, and Georgii Efron’s over three weeks. Elena Dobychina, setting out from Leningrad, journeyed for 20 days, and Victor Zhirmunskii one month. The city that greeted those displaced by the war struck most as foreign and unfamiliar. Tashkent did not yet boast the distinctively Soviet-style apartment blocks that would come to dominate its urban landscape after the earthquake of 1966. In 1941, plans to transform the city into a model Soviet city, a modern outpost in Central Asia, remained by and large paper projects. Tashkent was still a city of small one- and two-story houses and dirt lanes. It was divided between the Russian section of the city, built as a European colonial outpost in the late 19th century, and the Muslim district, or old town. Author Nadezhda Mandelstam later recalled the “small, squat houses and tall trees—a contrast peculiar to Tashkent.” The city was full of such contrasts. On the one hand, there were the “steep and narrow alleys.” On the other, there were broad streets and European squares. Whatever pretensions to Europeanness the new city in particular might have had, however, Tashkent was, in the eyes of most evacuees, an inescapably Asian city. The journey into evacuation was conceived as a passage from Europe into Asia. With worried looks, these Russian families, forced out of their cities and villages by the German invasion, seek safety hundreds of miles from the front. Many headed for the fabled city of Tashkent. Babochkin’s praise of Alma-Ata, after several months in Tashkent, underscores the prevailing vision of Tashkent among many evacuees. It was dusty and terribly overcrowded. Moreover, it was dangerous. There is not an account of the city from this period that does not at least mention the high levels of crime. “Banditry” preoccupied evacuees. A panoramic photo of civilians and soldiers fleeing the fighting in the Ukraine, 1941. Artists, writers, intellectuals, Party officials, and other prominent individuals often received privileged treatment during the evacuations. Rare was the evacuee who did not have something stolen. Alexander Kovarskii lost his new galoshes to a thief; Nadezhda Mandelstam was robbed of a ration of fish; Evgeniia Galina’s mother had her purse stolen, Olga Boltianskaia’s son his passport, and Olga herself some newly bought bread. Moreover—and perhaps most important—Tashkent was a foreign city. The city’s urban layout, the flora and the fauna, seemed distinctly un-“Russian,” and Russia itself seemed distant and removed. If the urban landscape, the sights and sounds, almost invariably struck newcomers as foreign, there were some respects in which Tashkent was nonetheless familiar. The squat houses, winding alleys and caravans of camels masked what was an all-too recognizable feature of the urban landscape—its institutional architecture. Despite the continued frustration of authorities in both Moscow and Tashkent at the failure to make Tashkent a truly modern city, it was an undeniably Soviet city. And what happened to evacuees once they arrived in Tashkent, their struggle to survive, is in many ways a typical Soviet story. Evacuated residents of Leningrad await transportation and ponder their future after crossing Lake Ladoga in April 1942. Olga Boltianskaia’s doctor even recommended she leave Tashkent. “In the north,” the doctor told her, “it would be easier for me.” The two most persistent causes of complaint, however, and the source of seemingly endless torment, were the daily struggle for food and the search for shelter. The deprivation and difficulties that characterized daily life in Tashkent were in no small measure a function of the war. Loss of territory and resources coupled with the necessity of shifting economic production from a civilian to a military footing put a significant strain on the Soviet state and its capacity to provide for the population. At the same time, the war set the limits of the Soviet system into stark relief. Access to scarce state-supplied resources was dependent on status, institutional networks, and connections. Russian historian Militsa Nechkina later recalled a “conversation between people in the film industry on the train” to Tashkent. “One of them, a prominent cinematographer, almost in tears, said to the other: ‘I don’t want to be a refugee.’ ‘You are not a ‘refugee,’ his friend reassured him. ‘You are an honored evacuee’ [pochetnyi evak].” The friend was quite right. “Honored evacuees” and refugees lived in very different circumstances. That said, not even “honored” evacuees were above the struggle to survive. Ironically, even those who were rescued by the state were sometimes left to languish in the rear. Akhmatova had been flown out of the city of Leningrad, but she nonetheless had to rely on friends to secure access to both shelter and sustenance. 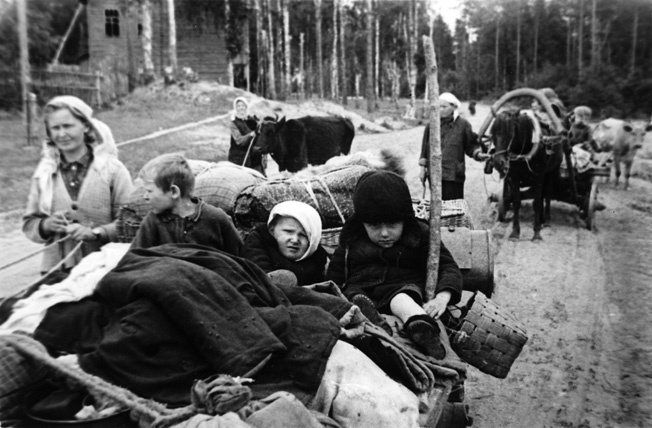 With cattle, children, and all the possessions they could cram into their wagons, civilians escape from the approaching German invaders near Leningrad, July 1941. Over 16 million Soviet citizens became refugees—probably the largest mass migration in history. Material reprinted from To the Tashkent Station: Evacuation and Survival in the Soviet Union at War, by Rebecca Manley. Copyright © 2009 by Cornell University. Used by permission of the publisher, Cornell University Press. Tags Allies, Axis, Belorussia, Black Sea, Eastern Front, Joseph Stalin, Latvia, leningrad, Moscow, Novosibirsk, Operation Barbarossa, Sevastopol, Soviet Union, Stalingrad, Ukraine.